Now N is 8 years old and it’s the time when he can no longer normally go into ladies toilets or changing rooms. Given that most changing rooms say that 8 year olds and over have to go in their own gender changing room, I assuming that this is similar for toilets. And poses some issues. Letting your children loose without you is something we all have to do and until this day approached I wasn’t too worried about it. The age of 8 was ages away or so I thought. 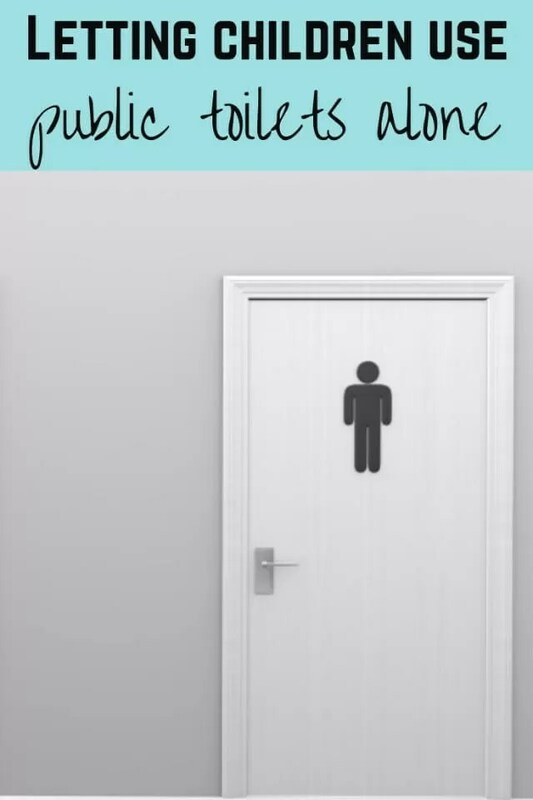 It comes round very quickly though, and when you see other parents worrying online and saying they won’t be letting their children into public toilets without them, it does start to make you wonder whether you’re too relaxed about it. Obviously the age and maturity of the child will vary depending on the child. N is quite a sensible boy, but he’s quiet and I can’t imagine him saying boo to a goose. He’s probably quite naiive given he’s never had to worry about safety where we live. If there were no other worries and dangers, I’d be perfectly happy to let him go in without me, and without me standing right outside the door. Most of our days out and going to town are to places with enclosed public toilets, rather than in big cities with more people around that you might not know. I know he’s capable of sorting himself out, making sure he’s washed his hands etc. But there’s always that back of mind what if something happens would he be able to cope? Despite me thinking he’s plenty old enough, my worry is that as it’s always me he goes out with. He’s never really experienced men’s toilets. On holiday when he was 4, the OH took him into mens public toilets and walked him straight out again because of the state of it. I had to take him into the ladies. Which is all very well, but how is N going to know what to avoid, what not to touch etc, if his dad has never taught him. I don’t know what it’s like in men’s toilets other than therer is usually urinals and maybe a couple of cubicles. And I presume they’re filthier than the women’s ones. Maybe I’m going to have to be more picky about where we go and what toilets are available. Because there’s very few family toilets around. Where we live is very rural and cosy. It’s comfortable, it’s familiar, and N hasn’t been in a situation where he hasn’t known how to act. He’s aware that he shouldn’t speak to strangers, and I’ve said to stick to going in cubicles in the toilets. But how do you tell children how to act in certain situations, without making them scared to go in in the first place? The main thing is teaching him to stay away from anything that makes me feel uncomfortable. If any strangers approach him, or anyone that isn’t making them feel right, then leave the situation and find help. And if approached, say no, make a noise, leave and tell a trusted adult. There’s also teaching him not to pick up anything that’s in toilets. because you never know what children might spot, and try and pick up to find out what it is. Before I started thinking about all the worrying things, and hearing what others were saying about all the dangers of boys not being old enough to go in men’s toilets, I was fine. I didn’t worry. I just didn’t think about these things. But the more you think about potential dangers the more you worry and wonder how much do you really need to say to the child. Last weekend was the first time N had to go into the men’s changing room at swimming. This should be fine as he goes in each week with school so he knows the layout of the room and he’s good at keeping all his stuff together. The only people who go in there are dads with their children and given how busy the women’s changing rooms are usually on Saturdays I would imagine the mens are fairly empty. I wasn’t too worried about this. When we’ve been out and I’ve said he needs to use the men’s, he’s stopped a moment, then remembered he needs to pee. And then not worried about going in. He’ll come out and tell me if it was empty, and so far the toilets usually have been. I might do some reading up on the NSPCC website and see what their recommendations are about talking to children about personal safety in these types of places. When we are out and about I will certainly be thinking about more about where we stop for a break, and which leisure centres we go to. I’ll try and find those where they have unisex changing with cubicles near or opposite each other so N can have independence but I can still keep an eye on him. I’ll be looking up some reading on this topic to see if I can find some advice on the kind of things you should be teaching your children. There’s nothing like leaving it till the last minute but it’s just something I hadn’t really thought about in advance. If I had a girl, I don’t think I’d be so concerned. Reading forums and other mum’s concerns, it’s always about boys going into men’s loos. I wonder what men think about their daughter’s having to go into ladies toilets on their own without them? Or even into the men’s with them? How did you deal with this when your children were approaching old enough and had to go into changing rooms and public toilets without you? What age did they start going into the correct toilet without a parent?